In an interview with Renault's deputy director of engine, Rob White it comes apparent that the team considers itself better prepared than last year, helped by modifications to the engine and the KERS system from Magnetti Marelli. Rob, this year sees the introduction of a whole raft of new technical regulations. What are the main modifications on the engine side? Due to the engine freeze that has been in place since 2007, we will continue this year with our RS27 engine. However, the 2009 rules introduce some changes that mean we have to review things. For example, the life cycle of the engine has been increased as engines must now last for three Grands Prix instead of two, and the number of engines is also reduced. This therefore requires an increase in engine life which almost doubles what we have been working with up until now. For that to be possible, the rev-limit has been lowered to 18,000rpm instead of 19,000rpm. These changes may seem insignificant compared with the other major changes, but they require significant work by our team of engine engineers. Precisely, what modifications have you had to make to the engine to meet these new technical regulations? In a world of frozen engines, the options were limited. It was a case of working to optimise the engine in the new context while managing this transition. So we have made very minor modifications, such as the position of the injectors and those sorts of things. Yes, absolutely. The introduction of KERS has only been on the table since the end of 2007. It’s therefore a technology that we have had to learn very quickly to be aware of the significant impacts this system is going to have. Several solutions were possible for the installation of KERS. 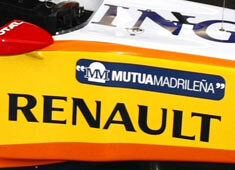 What has the ING Renault F1 Team opted for? The rules state that modifications to the front or rear of the engine are possible to allow the integration of KERS. As far as we are concerned, we’ve opted for the integration at the front of the power train. It’s a classic solution of electrically driven machinery at the front of the engine with a system of batteries installed in the chassis. Some other teams have also opted for this solution. What has been the approach of the ING Renault F1 Team in managing these rule changes? As usual, the final decisions in terms of the 2009 technical regulations were made very late. We therefore had to advance progressively as the negotiations took place and work in the detail once the regulations were finalised. Obviously it’s not the most straightforward way to manage such a project, but it’s the same situation for all the teams. In the context of reduced costs, we have had to accelerate some phases of development and so it’s important to be able to react quickly and, above all, better than our competitors. How do you see the start of the 2009 championship unfolding? There are numerous changes this year and so we can probably expect to see more significant gaps between the teams than we have seen in the last couple of seasons. We were just getting to a stage where the regulations had reached a level of maturity and as a result were being managed well by all the teams. This year, there are lots of new regulations, which should allow some teams to find an advantage. However, little by little I’m sure that we will all move towards the same technical solutions and that there will be a level of convergence in terms of performance. What are your hopes for Renault in 2009? I think we all want to see the ING Renault F1 Team fighting for the podium at each race. We know that’s not going to be easy, but that’s why we enjoy the challenge of motor racing. We must attack the championship determined to win and by doing everything in our power to do so. I know our team is hungry for success and we’ve already shown that we can bounce back with our two victories in Singapore and Fuji last year, which were a great boost for the team.